Mike is an approximately 10-year-old white & red male. He is not tattooed. Along with Ernie and Ralph, he was surrendered from a home in Snyder, TX when his owner could no longer take care of the 7 total dogs and 25 cats. 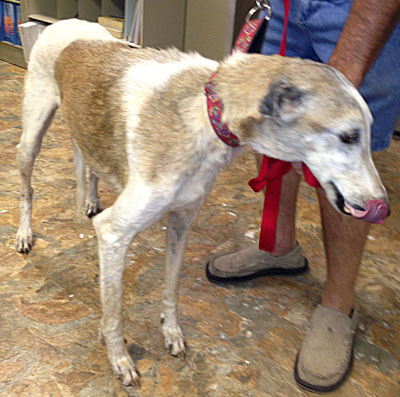 He is a smaller male with some wavy hair so he may have some borzoi or saluki in him. Mike was covered in fleas and ticks when he arrived, but thankfully he is negative to heartworm and tick borne diseases! 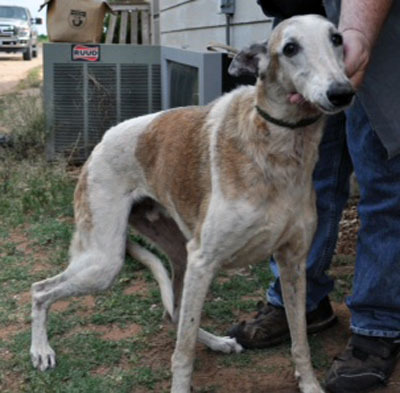 He is being medically evaluated by Dr. Wick Culp at the Animal Medical Center in Amarillo. Mike lost quite a few teeth during his dental by Dr. Culp, as well he had numerous hemangiosarcomas removed externally all over his body. He is being treated for several intestinal parasites. Mike is living peacefully with cats.